This map was created in GEO 243: Remote Sensing by undergraduates Diane Portillo and Summerlyn Turner as part of a project to distinguish the relationship between phytoplankton blooms and oceanic surface temperature. Phytoplankton and their significant roles in aquatic environments can cause both beneficial and detrimental effects to their ecosystems - specifically in terms of algal blooms. The blooms are directly associated with the availability of certain contents including sunlight, nutrients, and temperature. To explore the dynamic association, Diane and Summerlyn questioned if phytoplankton blooms had increased in the Gulf of Mexico between the years of 2006 and 2018. Satellite images from Landsat and USGS Earth Explorer enabled Summerlyn and Diane to explore oceanic surface temperature change in the Gulf of Mexico. By comparing and analyzing images collected from the satellites from 2006 and 2018, the students were able to assess the differences in oceanic surface temperature ranges. 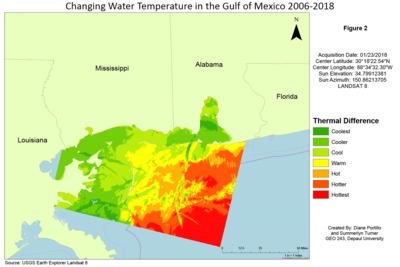 The project ultimately determined that rising water surface temperatures in the Gulf between 2006 and 2018 led to a decrease in phytoplankton growth.